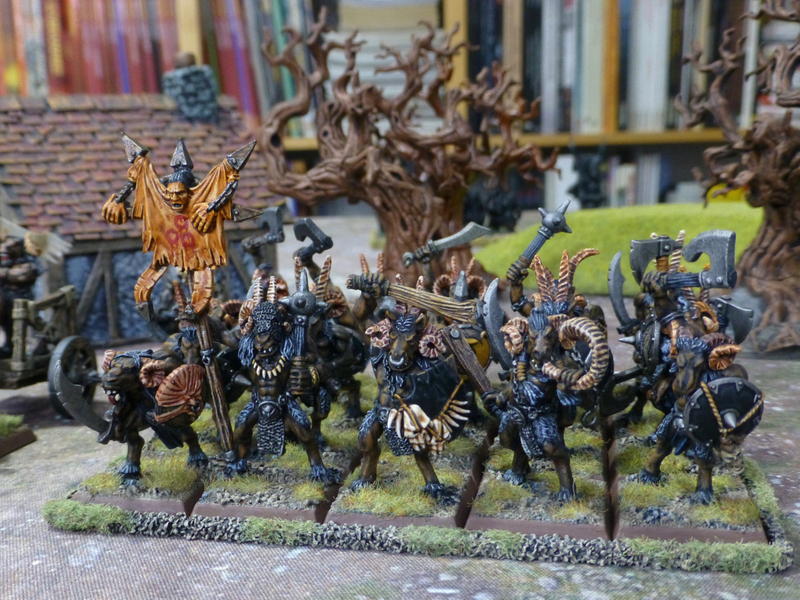 While doing a roll call of my various work in progress armies for Warhammer Fantasy Battle I came across a mostly finished herd of Beastmen Gors that required a few updates. I drybrushed the bases brown where they were grey before and repainted the edges in my now standard Gorthor Brown. 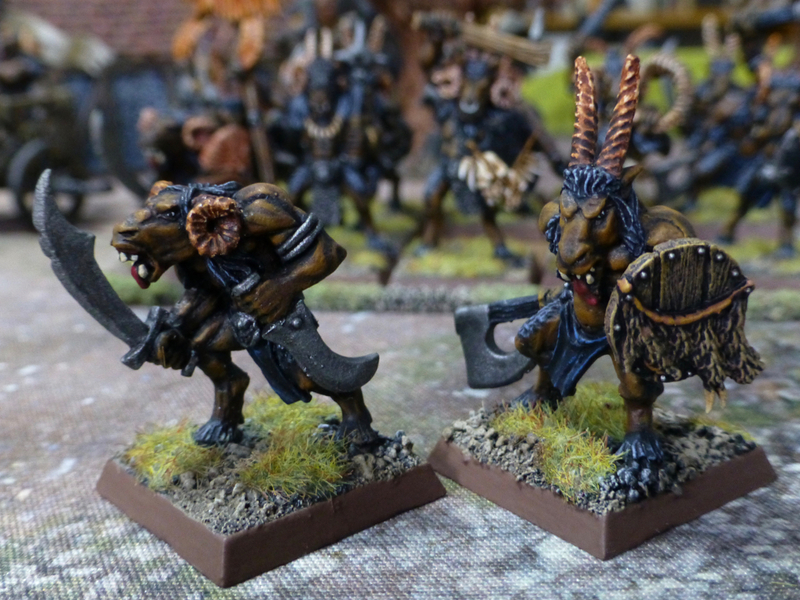 I also found that I was one warrior short since I intend to use the previous leader of the herd as a Wargor in the 1,000 points force. 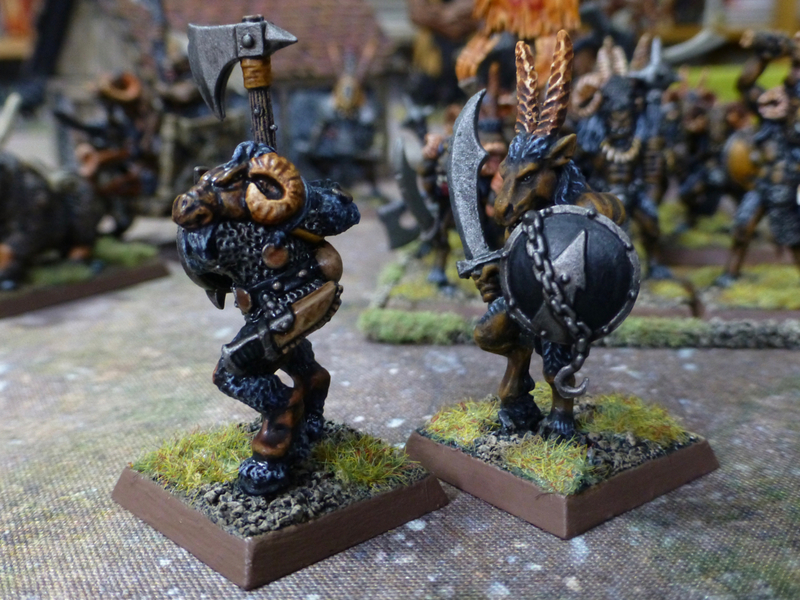 Since I had a spare model from the Marauder Miniatures MB09 Beastmen Regiment with a missing double handed club, I converted that figure by giving it an axe and shield from the plastic Citadel Chaos Marauders. About half of the other Gors also received shields from that set, as none of the regiment was equipped with any. 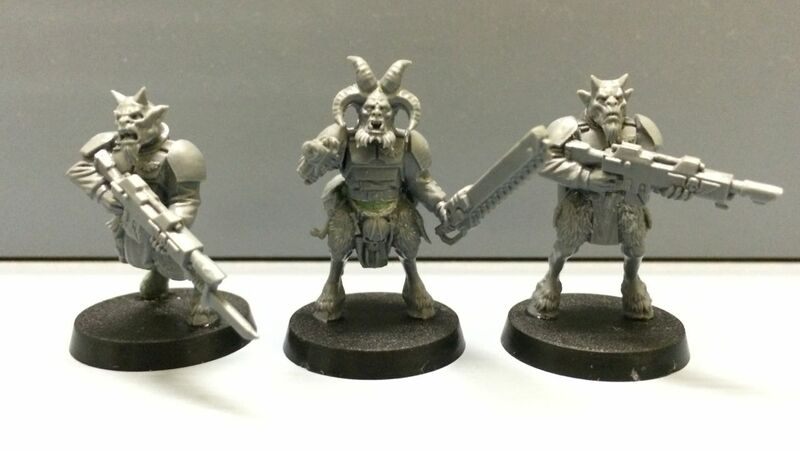 Some of the Beastmen had previously been converted to wielding two hand weapons, while the remaining ones were now given shields from the Ungors plastic set. 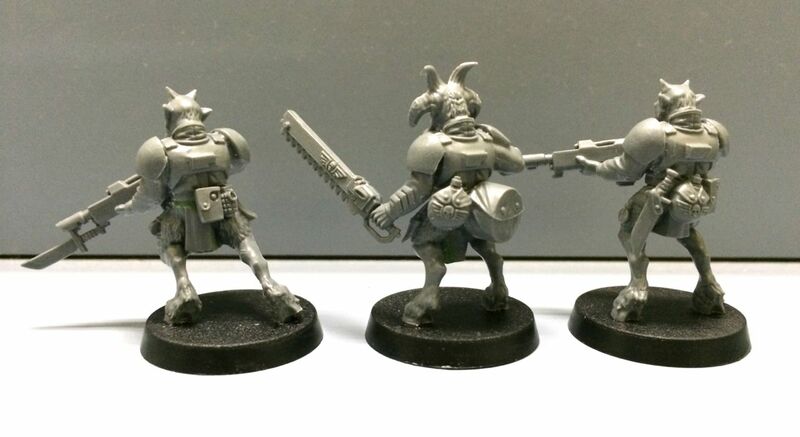 Since I am operating as a Rogue Trader in the furthest reaches beyond the Nephilim Sector at the moment, my hobby activities are severely restricted. Rather than painting with a limited travel palette, I decided this weekend to embark on a small conversion project that I have been meaning to realise for a while (i.e. 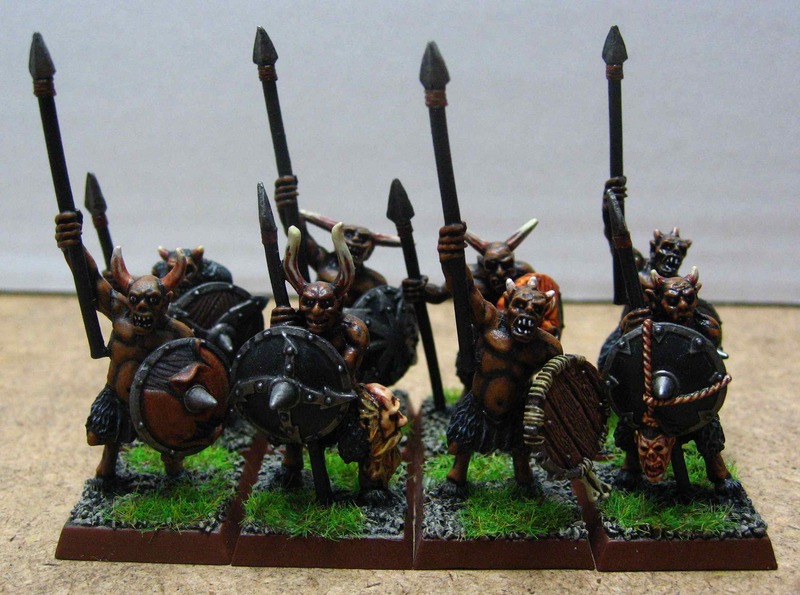 ever since I started playing Warhammer 40k back in the Rogue Trader days) – Imperial Beastmen. 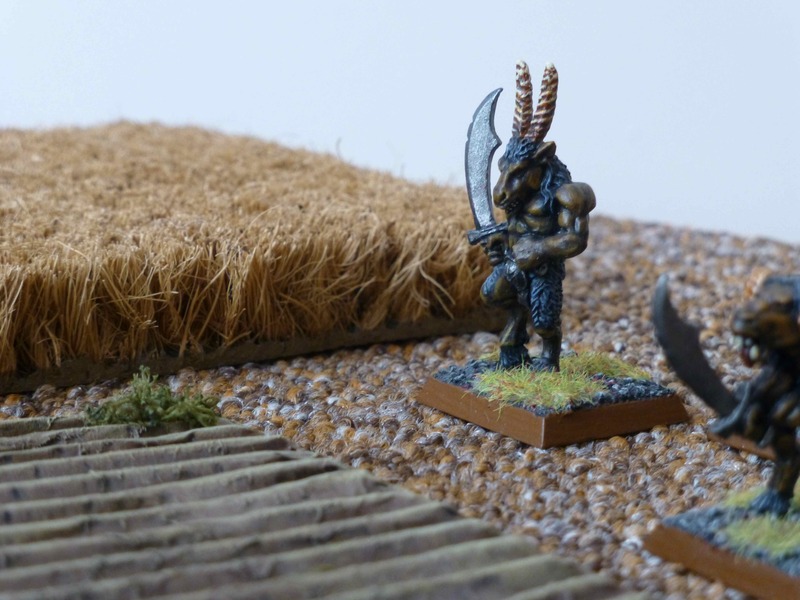 Beastmen have it tough in today’s Imperial Army/Guard/Astra Militarum, with barely a mention of abhuman citizens, never mind soldiery, other than Ogryns and Ratlings. 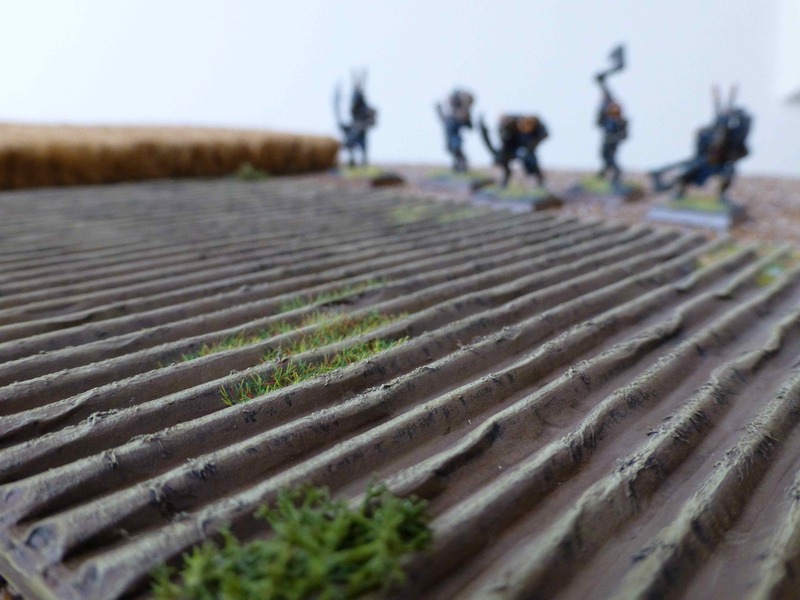 That leaves lots of space though for improvisation, and I have a couple of ideas for a back story to a platoon or two that I am planning on inducting into my forces. I started off with an Ungor Herd for Warhammer Fantasy and a squad of Cadian Shock Troops, which fit together just as well as I’d hoped. I left the majority of trinkets like bones, skulls and pouches dangling from the uniform belts for a slightly feral look. The loin clothes were a bit too shaggy though for any quartermaster to approve of, so I filed them down to an even hemline. There’s very little green stuff needed to fill in gaps between upper and lower bodies, and the additional of ammo, bayonets and canteens quickly hide any irregularities. 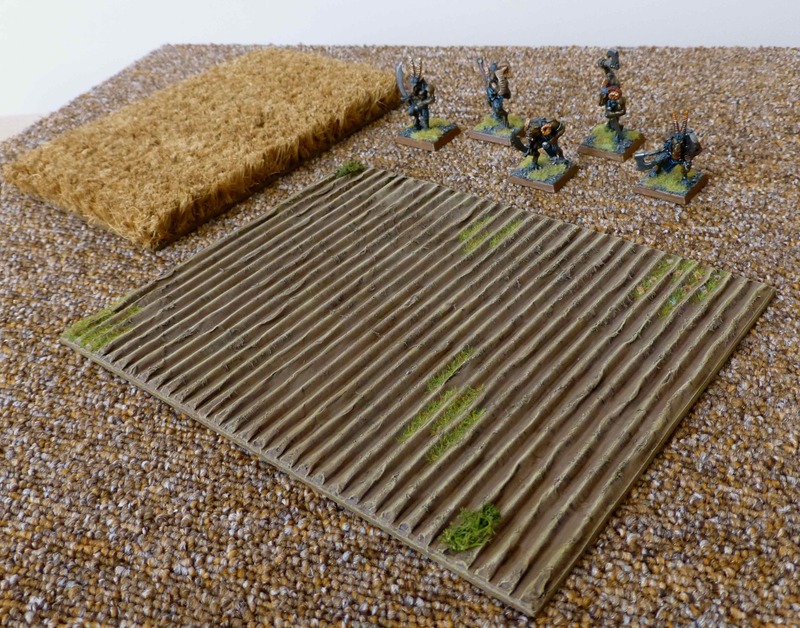 Since I am in the mood for Warhammer scenery at the moment, I decided to make two staples of wargaming terrain – the wheat and the ploughed field. I had various versions of them in my collection over the years but these ones are meant to last. 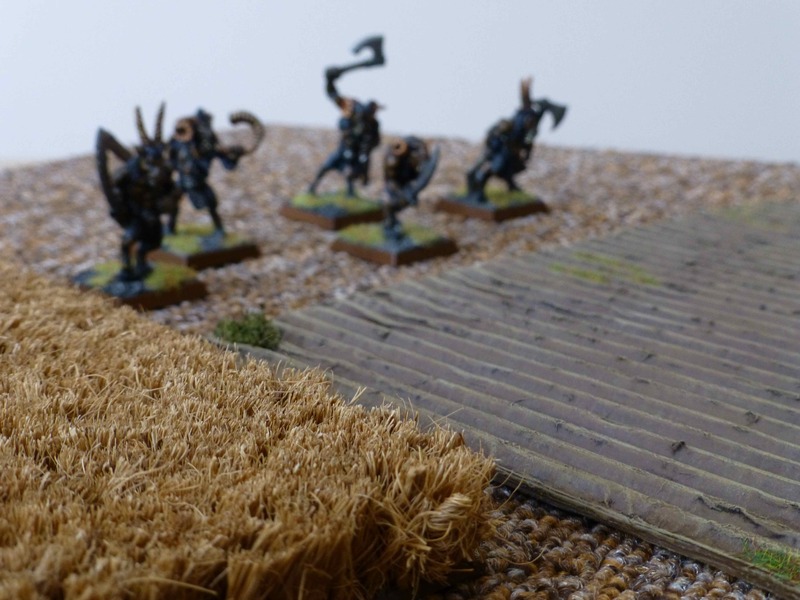 The ploughed field looks neglected, and we can see the reason why – marauding bands of Beastmen have been terrorising the local populace and driven them off their land. The wheat field was as simple to create as finding the right type of door mat in my local DIY store, cutting off a slice, painting the edges brown, and sticking the rest outside my door. Two purposes fulfilled for a fiver, not bad. I glued the corrugated cardboard onto a sheet of sturdier cardboard to prevent it from warping, make it less prone to move around during games and to make sure it will survive many a battle. A tip for removing the upper layer of the corrugated cardboard: wet it lightly with a moist sponge and pull the layer off when the water has just soaked through it without having reached the middle section. 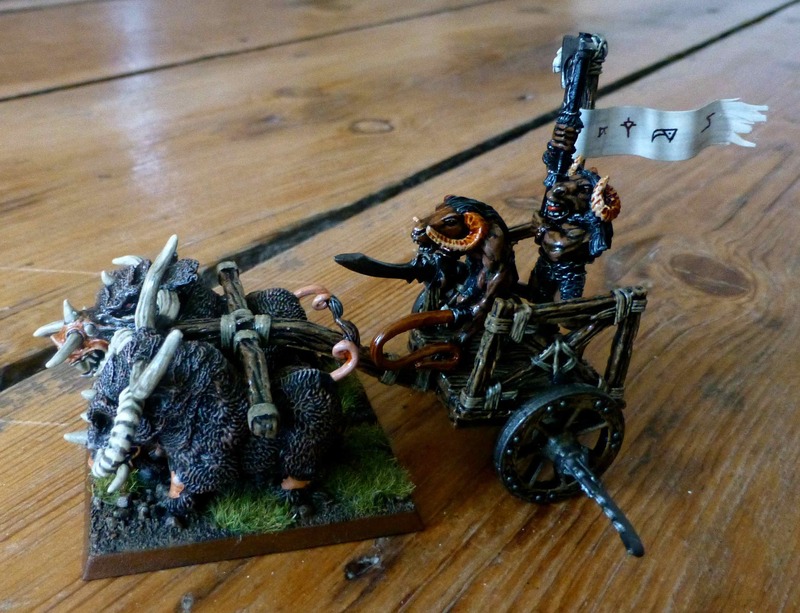 I painted this Beastmen Tuskgor Chariot for Warhammer many moons back already. 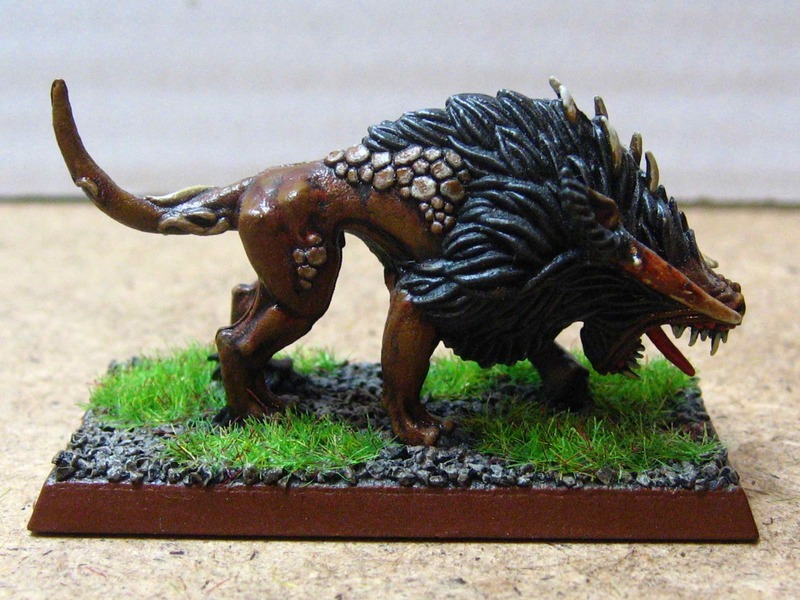 It’s part of my skirmish force sized collection of these true children of Chaos. 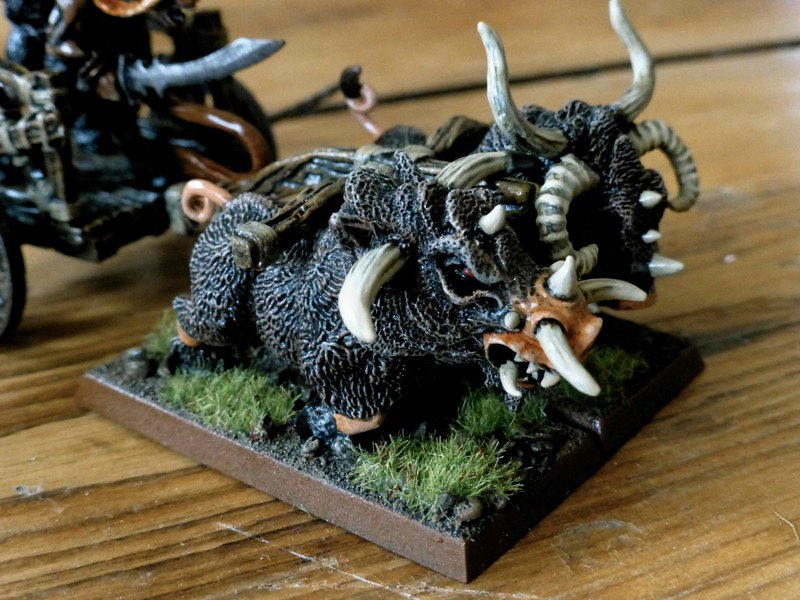 The ramshackle construction of the cart and the stout and brute look of the Tuskgors gives the chariot the appearance of an infantry fighting platform rather than a swift shock weapon, which goes well with their background in my view.